Nitrile is an elastomer that is known for its good stability against thermal aging, low resistance to friction and high chemical corrosion resistance. Nitrile O-Rings – Arizona Sealing Devices, Inc. These properties and others allow the use of this particular type of o-ring in aerospace, automotive, oil field exploration and processing, petro-chemical, water processing, paper mills and other performance-demanding industries. Nitrile O-rings are rubber o-rings that are placed between two parts connecting a machine or piping system to create an impermeable seal and block the leakage of gases or liquids. The disc is placed within a groove between two joint components. When pressure is applied to close the joint, the rubber material deforms. This is known as compression deformation and is an integral feature of o-ring seals, as it completely closes any and all gaps between surfaces and objects. Compression may be continuous as it is with static seals, or interrupted with the motion of pistons or hydraulic cylinders as with dynamic seals. Although low resistance to friction is a favorable characteristic of nitrile, lubricants are still used with this type of o-ring, to prevent wear and prolong the life of the product. Industries that favor nitrile o-rings include oil and gas companies, food and beverage companies, aerospace companies and chemical companies. Nitrile o-rings are versatile, partly because of the wide range of temperatures they can endure. A synthetic latex, nitrile contains no latex proteins and has excellent resistance to wear and puncture. This particular elastomer has a higher degree of flexibility and solvent resistance than many alternative o-ring options. Additionally, the physical strength and retention of properties through prolonged chemical exposure make nitrile an excellent option for o-ring construction. As nitrile compounds can withstand temperatures ranging from -40°C to 165°C, it is very versatile for both hot and cold applications. While nitrile rubber may be used independently, it is often saturated or hydrogenated in solutions of precious metal catalysts, which convert the natural double bonds of nitrile to more stable single bonds. The degree of saturation can range from 4% to 10%. Hydrogenated nitrile butadiene rubber, carboxylated nitrile and highly saturated nitrile are just a few of the processed nitrile variations used to make o-rings. The fillers used exacerbate the already desirable qualities of nitrile and improve tensile strength. 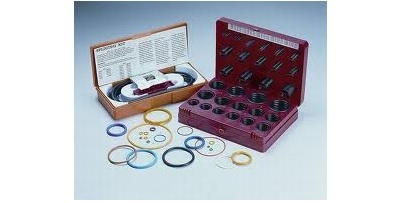 The o-ring is created from these materials using several different rubber molding processes such as injection molding. When selecting the proper nitrile o-ring considerations should include width, thickness, inside diameter, outside diameter, intended use and the specific hydrogenated or saturated variation of the substance. 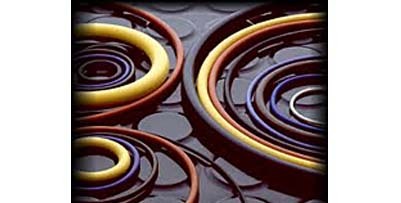 Nitrile O-Rings Nitrile o-rings are round, disc shaped molded rubber sealing devices that serve as integral connecting pieces for equipment components in a broad array of industries.